Raumfahrt+Astronomie-Blog von CENAP - Blog: Mars-Chroniken - Hat Mars Rover Curiosity Spuren von vergangenen Lebens gefunden? During its wheeled treks on the Red Planet, NASA's Spirit rover may have encountered a potential signature of past life on Mars, report scientists at Arizona State University (ASU). To help make their case, the researchers have contrasted Spirit's study of "Home Plate" — a plateau of layered rocks that the robot explored during the early part of its third year on Mars — with features found within active hot spring/geyser discharge channels at a site in northern Chile called El Tatio. The work has resulted in a provocative paper: "Silica deposits on Mars with features resembling hot spring biosignatures at El Tatio in Chile." As reported online last week in the journal Nature Communications, field work in Chile by the ASU team — Steven Ruff and Jack Farmer of the university's School of Earth and Space Exploration — shows that the nodular and digitate silica structures at El Tatio that most closely resemble those on Mars include complex sedimentary structures produced by a combination of biotic and abiotic processes. 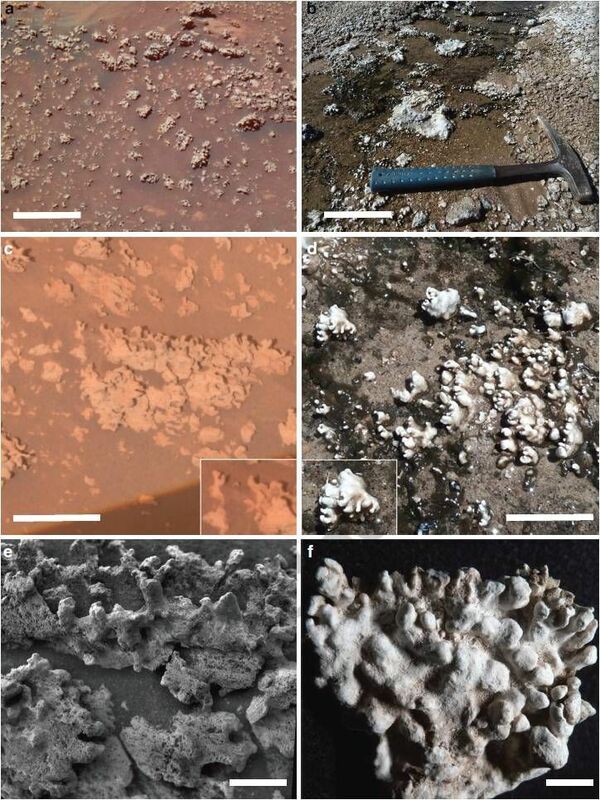 "Although fully abiotic processes are not ruled out for the Martian silica structures, they satisfy an a priori definition of potential biosignatures," the researchers wrote in the study. Spiritlanded on Mars in January 2004, a few weeks before its twin, Opportunity, touched down in a different part of the Red Planet. Both golf-cart-size rovers were tasked with looking for signs of past water activity during their missions, which were originally planned to last three months. Spirit encountered outcrops and regolith composed of opaline silica (amorphous SiO2nH2O) in an ancient volcanic hydrothermal setting in Gusev crater. An origin via either fumarole-related acid-sulfate leaching or precipitation from hot spring fluids was considered possible. "However, the potential significance of the characteristic nodular and [millimeter]-scale digitate opaline silica structures was not recognized," Ruff and Farmer noted in the new study. Spirit imagery shows opaline silica nodular outcrops adjacent to Home Plate showing typical stratiform expression. White outline highlights nodular silica outcrop. Rover wheel tracks are roughly 1 meter apart. Rolling wheels did not deform the roughly 6-inch-high high outcrop (lighter tracks) compared with the inoperative dragging wheel in a later traverse (darker track). The physical environment of El Tatio offers a rare combination of high elevation, low precipitation rate, high mean annual evaporation rate, common diurnal freeze-thaw and extremely high ultraviolet irradiance. "Such conditions provide a better environmental analog for Mars than those of Yellowstone National Park (USA) and other well-known geothermal sites on Earth," suggested Ruff and Farmer. "Our results demonstrate that the more Mars-like conditions of El Tatio produce unique deposits, including biomediated silica structures, with characteristics that compare favorably with the Home Plate silica outcrops. The similarities raise the possibility that the Martian silica structures formed in a comparable manner." Previously, a NASA science team defined a potential biosignature as "an object, substance and/or pattern that might have a biological origin and thus compels investigators to gather more data before reaching a conclusion as to the presence or absence of life." "Because we can neither prove nor disprove a biological origin for the microstromatolite-like digitate silica structures at Home Plate, they constitute a potential biosignature according to this definition," Ruff and Farmer wrote. Spirit bogged down on Mars in May 2009, becoming stuck in soft soil. The ASU researchers suggested that a future and specially instrumented rover mission could perhaps provide a more definitive assessment of possible biogenicity of Home Plate silica structures. "However, because of the challenges in obtaining unambiguous evidence in situ, coordinated microscopic and compositional analyses of samples returned to laboratories on Earth may be required to reach a robust conclusion as to the presence or absence of past Martian life in these rocks," Ruff and Farmer stated.